Erin took a seat against the wall beside Holtz and turned her phone upward to provide some light. After a moment, Erin bumped her friend’s shoulder lightly with her own. Holtz glanced back. Holtzmann accepted the side hug instantly, the light on the torch flicked out which plunged them back into darkness. With the power out, not even the ever-present New York City glow could keep the darkness out; minus the tiniest glow from Erin’s phone, they were truly in pitch black. Holtz’ hands clutched tightly to Erin’s shirt and Erin could feel the trembles that coursed through her friend. She rubbed her hand down Holtz’ arm gently and felt her relax the tiniest bit. This closeness wasn’t new. Since the first “come here often?” Holtz had just… fit. Erin hadn’t been troubled by it; she hadn’t noticed it. It all just seemed so natural, she hadn’t questioned it until feelings had started to complicate the issue. Hello, my name is Eevachu and I have descended into Ghostbusters and fanfiction hell. Welcome. People ask me occasionally if I can write. I can. Absolutely. I’m not GREAT at it, but I manage. So I’ve started taking holtzbert fanfic prompts because honestly, election got me bummed, work got me bummed, the crippling fear I will never find the girl of my dreams to spend the rest of my life with got me bummed. You know, the usual. 2016. Adobe Photoshop CS6; Surface Pro 3; Original is 1456 x 2082 px. There, backed into a corner, clutching a lit torch in both her hands was Holtzmann. Even in the meagre light the small flame provided, she was a portrait of terror. AKA: Jillian Holtzmann was good about hiding her fears until she accidentally started living with Erin Gilbert. This is (I think) my first official foray into fanfiction. Apologies for any grammar kerfuffles, I’ll be writing everything on my phone, in the middle of the night, and likely in a state of gay distress. 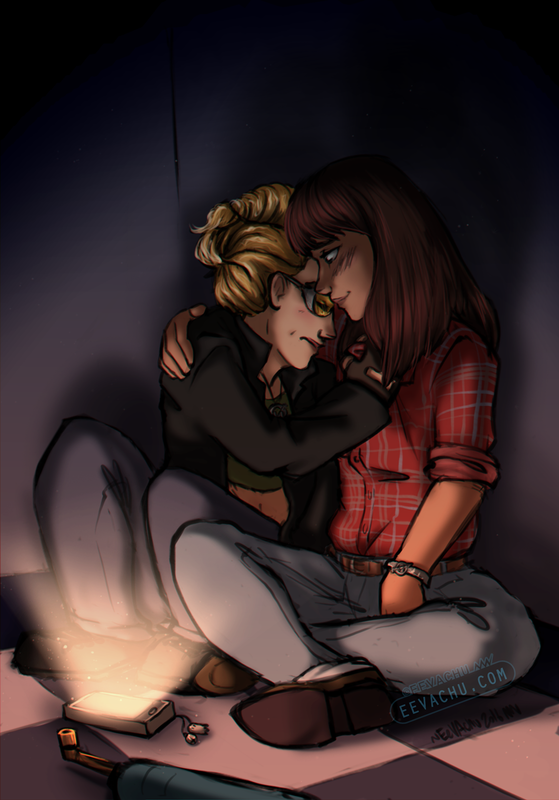 “Jillian is secretly scared of the dark and needs Erin to snuggle her until she feels safe again. Isn’t that adorable???? Like, Jillian would be this little scared ball and Erin would just MELT because her poor smol bby!!! Prompts are open. Hit me up on Tumblr/Twitter @eevachu! If I like them, I’ll make something for them, but no promises. She wasn’t sure if it was the burst of lightning or the roll of too-close thunder that woke her, but she was certainly awake now. A bleary-eyed assessment revealed that Erin had, in fact, fallen asleep at her desk again, as indicated by the presence of a drool puddle on the papers she’d been reading and the pencil stuck to her cheek. She’d also left all the lights on, apparently. She peeled off the pencil, returning it to the broken “Particle Physics Give me a Hadron” mug (courtesy of Holtzmann) it called home, and checked the time on her phone: 2:13 am. Perfect. Erin sighed. This had become a habit, this 90 degree desk napping and these sleepless nights. It was partly because she really did have that much work to get done (happily), now that ghosts were real and she was being paid to bust them. However, it was really mostly – entirely – because of her living situation. When they’d gotten the firehouse, it’d come with several apartments, enough for all of them to live together as one weird little family. To Erin’s dismay, however, Abby had chosen to keep her apartment, explained how it was already close to the firehouse, and she liked having her space. Patty too, had chosen to keep her apartment, because she had wanted to stick close to her other family and didn’t really want all her nosy nieces, nephews and baby cousins around nuclear devices. Erin had no idea where Kevin went off to, but he did. This left just Holtzmann and her (ALONE) for most of the time. This was fine in the beginning. Holtz was one of the better roommates she’d had, amicable to chores and common space cleanliness. This got less fine as Holtz became more… fine. Erin bit her lip unconsciously. She didn’t remember when her infatuation had turned inappropriate fixation, but she was sure it had a lot to do with Holtz and her lack of clothes on her downtime. If Erin had thought the woman a defier of clothing norms in her “work” look, sports bra and boxer shorts “free time” Holtzmann was the pinnacle of rebellion. Another flash of lightning illuminated her desk and Erin bolted out of her thoughts and upright out of her seat. A roll of thunder almost immediately rumbled through the air. The storm must have been almost on top of them. She could hear the rain and wind now, heavy and foreboding against the windows and walls of the firehouse. The lights flickered suddenly and then everything was dark. Erin moved before she realized she was in motion. Phone out, providing paltry light as she ran through the firehouse. She knew that scream; Holtz’ scream. She’d heard it before on busts, occasionally in the lab, but never like this, never this terrified. By the time she’d rounded the corner to the lab, Erin was in a full panic. “H-hey there, Er-Bear. Glad to see you. Wh-what’s up?” Her voice was full of shaky bravado; her breath, rushed and ragged. She looked so young, trying for a brave face like she was; so young, and so utterly afraid. “Holtz, are you okay? Did you hurt yourself?” Erin cautiously crouched over her, she ran the light of her phone over her to assess potential damage. Holtz shielded her eyes from the sudden brightness with her forearm. “If it’s about you, I’m going to worry.” The words were out of her mouth before Erin could taste the weight of them. “It’s stupid.” Holtz turned away, deflecting. “I’m sorry! I’m sorry! It’s just- You hunt ghosts for a living! We’re in dark spooky places all the time, why aren’t you scared then?” She half-chuckled at the notion: Dr. Jillian Holtzmann, afraid of something so mundane as the dark. Another beat of silence. Erin knew to be patient when Holtz was serious, somehow she knew that so many hadn’t. They’d rushed her through these moments or ignored her entirely. Holtz felt like the smallest earthquake, shaking like she was, but powerful like she could still pull the world down into her. Oh. Erin’s heart skipped a beat. Oh. Oh! Erin flushed and looked down at her. Holtz didn’t look up. “Or maybe we could not,” she played nervously with the collar of Erin’s blouse. “And do what?” The confusion furthered. Oh. Tonight would apparently be a night of oh’s. “Okay,” There’s really no one other answer. “Okay?” The eagerness in Holtz’ voice made Erin’s heart twinge with something she couldn’t identify. “I’m good. You light up my life already,” she finally glanced up to meet Erin’s gaze. All at once Erin couldn’t breathe. “Sorry, that was cheesy,” Holtz looked back down; interpreted the older woman’s shock for discomfort. “It’s- it’s okay. Cheesy is okay,” Completely. Utterly. Nothing has ever been more okay. “Yeah?” Her eyes are… what? Hopeful? Erin’s brain is used to unraveling the universe; why is this one engineer’s mind so fantastically confounding to Dr. Gilbert? “Hm. Good to know.” Holtz almost relaxed. Almost. The world seemed so still in the darkness. The heavy rain drummed distantly outside. It was all so… Romantic? Comfortable? Terrifying? Yes. All of those and more. “Oh.” Holtz shifted and made to get up. The arm around her tightened instantly. “No- wait I mean- Cheesy is okay,” stuttered Erin. She looked desperately at Holtz. “Oh,” came the tiniest whisper in the darkness. Erin could barely see her eyes, but she knew there was something important there looked back at her. She didn’t have time to further analyze it however, as Holtz crashed into her. Erin swooned in a way that only one Jillian Holtzmann could inspire in grown women. Her lips were soft; impossibly so. Her hands on her neck rough and calloused, but gentle. It was brief, it was amazing, and as Holtz pulled away, all Erin could do was try to follow. Holtz smiled the widest smile Erin had ever seen. It was Erin’s turn to surge forward, her hands came up to cradle Holtz’ cheeks. The kiss was all grins and giggles and it was perfect. As the giggles subsided, the kiss deepened. Erin’s hands tangled into Holtz’ hair and pulled her closer. The action pulled what Holtz would later vehemently deny was a whimper. Holtz broke from Erin’s lips and trailed kisses down into the crook of her neck. The angle had Erin craning her neck and shifting to give Holtz better access. But the shift reminded Erin of their position, which wasn’t the most comfortable in all honesty. She aimed to rectify it. “You know, I might have a nightlight in my room,” Erin managed. Holtz broke away and even in the near darkness, Erin knew she was given a look. “That was a terrible attempt, Gilbert. C minus. The electricity is still out. Have you learned nothing from me? Try again.” Holtz nipped at her neck and returned to her previous exploration. Erin found that all the PHDs in the world were useless in assisting her thoughts while this woman engineered her demise with lips and teeth. “My bed is more comfortable than the floor?” She tried. “Better,” Holtz had migrated her ministrations upward and the breath against her ear sent a shiver through Erin’s whole body. Unexpectedly, the light on Erin’s phone shut off and Holtz noticeably stilled. “Sorry!” In a second, Erin had flipped the light back on, but the moment was gone. “C’mon, I’m exhausted anyways,” Erin offered a hand. Holtz took it, probably harder than she should have. She expected a trademark Holtzmann quip, but when none arrived, Erin noticed how wide Holtz’ eyes were in the glow of her phone. She noted how her hands hadn’t broken contact with Erin’s blouse as they stood. The woman that clung to her looked so young, Erin wondered how she’d dealt with this for so long; how many people knew? Did Abby? Did her parents? Was she just alone with this? Somehow, they managed to get to Erin’s bedroom with Holtz gripped tight to Erin’s hand, half-clinging to her. “Hey, you’re okay, I’ve got you,” Erin whispered as she had to briefly disentangle from Holtz to untuck her bedsheets. She climbed in and Holtz didn’t hesitate to join, all but burrowing into Erin. With a bit of blanket finagling, the pair had their little comfort cocoon all sorted. Holtz laughed after a moment, “Didn’t think this is how I’d finally get you into bed.” She’s all flirt and fire, but her voice shook and her body trembled and it melted Erin’s heart. She gingerly took the glasses off of Holtz’ face and placed them on the nightstand. “Just Abby knows,” all Erin could imagine was a little Holtz afraid in the dark and her grip on the younger woman tightened. “She usually does,” Erin agreed. Abby had this weird way of finding out things you needed help with. She was glad Holtz had Abby in her corner for this. Erin laughed. We. She liked the sound of we. They laid like that, in this newfound haze of comfort, Erin’s hand gently ran up and down Holtz’ still slightly trembling spine. “I’ll make it up to you,” Holtz let out a shaky laugh. Erin felt bold, “You promise to kiss me again when it’s light out, and I’ll call it even.” She needed to make sure. She needed to know this was a real thing. “Done dealio,” came the reply, without hesitation. In lieu of a handshake, Holtz kissed her again. Erin all but swooned again. This persistent swooning was going to be an issue. Not that she really cared in the moment. Erin wanted to retort, but all the want for banter had left her the minute Holtz kissed her again. The younger woman still trembled, but soon her breathing leveled out and her body was more still than Erin had ever seen it. She smiled. Forever with Holtz’ kisses sounded like a pretty good deal.